YSS Dakshineswar Ashram offers devotees of Yogoda Satsanga Society of India and Self-Realisation Fellowship the opportunity to take part in conducted group retreats twice a year, apart from individual retreats for devotees throughout the year. Retreat activities include twice daily group meditations, the revies of YSS meditation techniques, inspirational classes and various other devotional programmes, and periods of silence. There is also ample free time to relax and enjoy God’s presence in the beautiful retreat settings. YSS books are available for study, and the Dhyana Mandir is open for meditation. In its second annual conducted retreat in 2018, YSS Dakshineswar Ashram hosted devotees from September 21 to 23. The review classes and satsangas during this retreat were conducted by Swamis Suddhanandaji, Nigamanandaji, Brahmacharis Achyutanandaji, Swarupanandaji and Shreyanandaji. 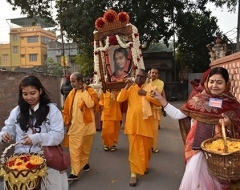 The three-day residential programme provided an excellent platform to approximately 70 participants from different parts of West Bengal, southern India and Japan to initiate or refresh their journey in the spiritual path following the tools Gurudeva Sri Sri Paramahansa Yogananda has designed specifically for this purpose. During this time, devotees attended the morning and evening meditations, satsangas by sannyasis to deepen their sadhana and by clarifying their doubts regarding the practice of Yogoda meditation techniques. Brahmachari Achyutanandaji conducted the opening Satsang with Guruji’s pioneering life philosophy of 'Being Calmly Active and Actively Calm.’ One should strive to remain calm and do all the external activities in the name of the Divine beloved in the 'Calmly Active’ phase. However, in the ‘Actively Calm’ state, one should calmly focus within oneself by keeping the mind in active mode but detached from the external environment. Brahmachariji beautifully explained the nuances of this state with practical references for clearing all the doubts experienced by the participants. YSS meditation techniques of Energization Exercises, Hong-Sau and Aum for preparation of body and mind to improve focus and concentration during meditation were reviewed by sannyasis during the review classes. 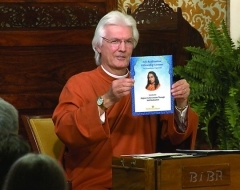 The methodologies of practicing each technique including benefits (which also included a review of the Kriya Yoga technique for Kriyabans) were clarified minutely and all devotees were urged to make an attempt to remember these during their daily practice for desired results. 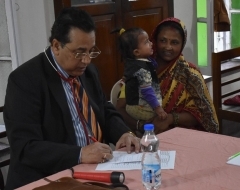 The other important point mentioned time and again in various sessions was regularity of daily practicing these techniques and meditation thereafter. The monastics stressed that one must take this seriously and go through the daily grind to prepare oneself for receiving initiation in Kriya Yoga technique, the aeroplane route for attunement with Divine Consciousness. A video of Sri Daya Mataji was screened on the first day during the evening programme, while on the second day, devotees enjoyed devotional singing along with Brahmachari Achyutanandaji during the bhajans in the evening programme. The conclusion of the programme was a closing satsanga by Swami Nigamanandaji. Devotees including new lesson students of YSS who participated in the retreat described it as "a joyous and enriching experience" and vowed to carry forward their blissful feeling of these last few days of retreat, to pursue their life’s goal with renewed vigour. To view glimpses from the three-day conducted retreat, click here.